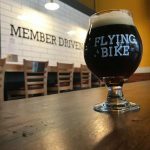 Well it’s been a pretty quiet month at Flying Bike, here in the depths of winter, when people take time off here and there for the holidays, visit with their families and friends, and make resolutions to avoid various low temptations. These vows often survive well into mid-January. We do expect things to be picking up here shortly. Meanwhile, our taps keep flowing with low temptations. Member-driven beers are holding down the fort. Sarah Rood’s Coffee Milk Stout was our best-selling beer its first week on draft. 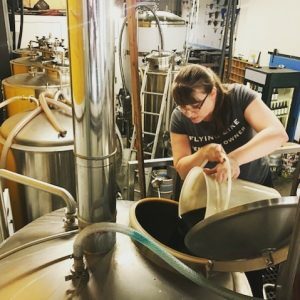 A coffee milk stout? That’s just crazy. 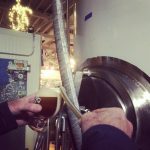 Now Eric Blume’s Phinneywood Porter has joined Raine Lightner’s IPA, Michael Jenkins’ Skagit Valley Pale, and Tony Ochsner’s CDA to showcase the homebrewing mastery of our member-owners. But that still leaves Scott and me a chance to improvise on occasion. That new big fermenter of ours gives us the luxury not only to brew in greater volume, but to brew more of the kinds of beer that might benefit from a little more time to develop and come into their own. That Equanot IPA that’s on tap now, our first batch out of that fermenter, just gets better by the day. Now conditioning in that tank is our next IPA, featuring El Dorado hops. But we’ll leave that one alone till it decides it’s ready. Because we can.